We are a leading Supplier and Manufacturer of Netted Chair such as Red Netted Chair and Black Netted Chair from India. These chairs are made up of high quality raw material using latest technology. These chairs are offered at highly reasonable rates to our clients. 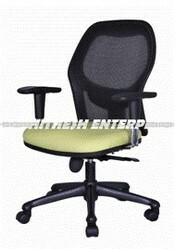 We are a reckoned enterprise, which is engaged in delivering Black Netted Chair to the clients. The offered range of black netted chair is made utilizing optimum grade raw material and innovative technology in strict conformation with the international quality norms and standards. Along with this, the offered range of black netted chair is suitably checked on different characteristics to maintain its authenticity throughout the designing process. Looking for Netted Chair ?